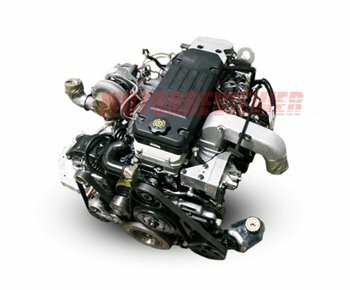 The ISB 5.9L is a straight-six turbodiesel engine, a member of the B engine family. The ISB engine was replaced its predecessor (the 6BT 5.9L) in 1998. The engine kept the main dimensions but received modern technologies which brought it to the next level of power, fuel consumption, and environmental friendliness. The engine block is made of cast iron. It has the same sizes of bore and stroke compared to the 6BT. The ISB has forged steel connecting rods, an assembled camshaft, and aluminum pistons featured symmetrical combustion bowl. The camshaft is installed inside the block. The ISB engine featured a multi-valve pushrod engine design. One of the most recognizable differences is a 24 valve cast iron cylinder head (but still is OHV valvetrain). Each rocker arm pushes two valves. Now the ISB engines use electronically controlled fuel systems (Robert Bosch GmbH) and a rotary type Bosch VP44 Electronic Fuel Injection Pump. The 24v engine had aluminum intake manifold, new single-piece red or silver aluminum valve cover for most comfortable and faster access to the engine components for servicing. The next step of ISB evolution was in 2003 when the engine was upgraded to a Bosch high-pressure Common Rail fuel injection system. The Common Rail injection increased power and torque, also noticeably reduced engine noise compared to the previous 24 valve Cummins engines. In 2001-2002 model year was a standard output and a high output ISB Cummins engines versions. High Output ISB had slightly bigger power (+10hp) and torque (+45 lb-ft) and was being offered with only an NV5600 six-speed manual transmission. A high output or HO 5.9L Cummins had higher compression ratio 17.2:1, more massive flywheel, changed fuel injection timing, the Bosch fuel system was tuned, providing more fuel pressure and the additional performance. The 2003 model year high output version offered perceptible 70 horsepower and 95 lb-ft more than the standard output ISB engine. In the last year, 2004, HO models had additional 20 horsepower and 45 lb-ft of torque. The HO Cummins wasn't offered in California due to harder emissions regulations in this state. The history of the 5.9 liters ISB engine was ended in 2007. The next engine for light-duty trucks from Cummins became more powerful and technologically advanced the ISB 6.7 - the last engine of B series. The ISB engine replaced the old 6BT for Dodge RAM pickup trucks in the middle of 1998. The less powerful 215 hp engine was equipped with the 47RE automatic transmission until the 2003 model year when 47RE was upgraded to hold more torque capacity and named as 48RE. 1998-2002. Electronically controlled Bosch VP44 rotary injection pump. 12 qts (11.4 liters) with filter. The ISB 5.9 continues to maintain a well-known reputation of the durable, reliable, and powerful diesel engine. The all-iron engine provides a long lifespan and opportunity for rebuilding. The engine has less camshaft wear; the electric pump rotates by electricity unlike a mechanical fuel pump, which driven by a camshaft gear on previous B series engines. However, the electronic system left their mark. The electronic VP44 pump had failure number higher than the older mechanical P7100 injection pump. The Common Rail injection is very pricey to fix and more sensitive to quality of fuel..
Automatic transmission - 215 hp at 2,700 rpm, 420 lb-ft at 1,600 rpm. Manual transmission - 235 hp at 2,700 rpm, 460 lb-ft at 1,600 rpm. Standard version for manual and automatic transmission - 235 hp at 2,700 rpm, 460 lb-ft at 1,400 rpm. HO version with manual transmission - 245 hp at 2,700 rpm, 505 lb-ft at 1,600 rpm. HO version with manual transmission - 305 hp at 2,900 rpm, 555 lb-ft at 1,600 rpm. Standard version for manual and automatic transmission - 305 hp at 2,900 rpm, 555 lb-ft at 1,400 rpm. HO version with manual transmission - 325 hp at 2,900 rpm, 610 lb-ft at 1,400 rpm. Cars offered in CA - 235 hp at 2,700 rpm, 460 lb-ft at 1,400 rpm. Single version produced 325 hp at 2,900 rpm, 610 lb-ft at 1,600 rpm.